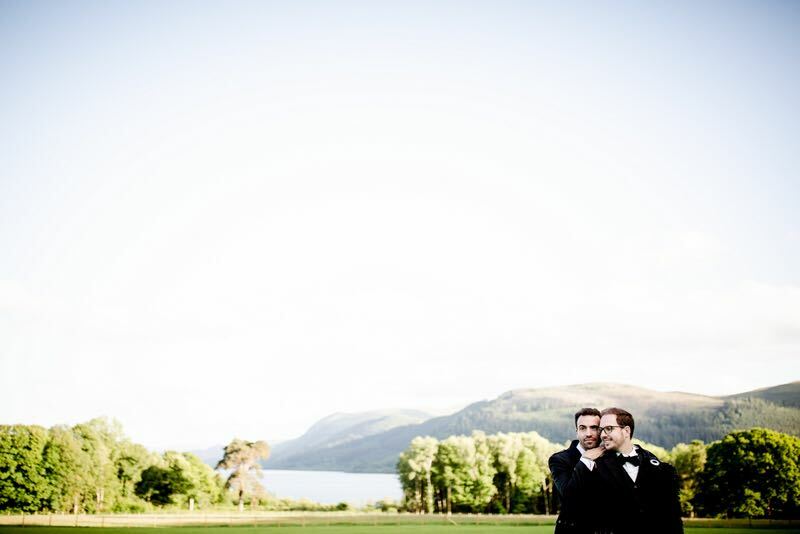 The gorgeous Romain & Yohann got in touch from their home in France and we arranged a Skype meeting on Valentines Day. They shared with me how they met and came to be, we bonded over being keen animal lovers – they have three dogs and three cats! 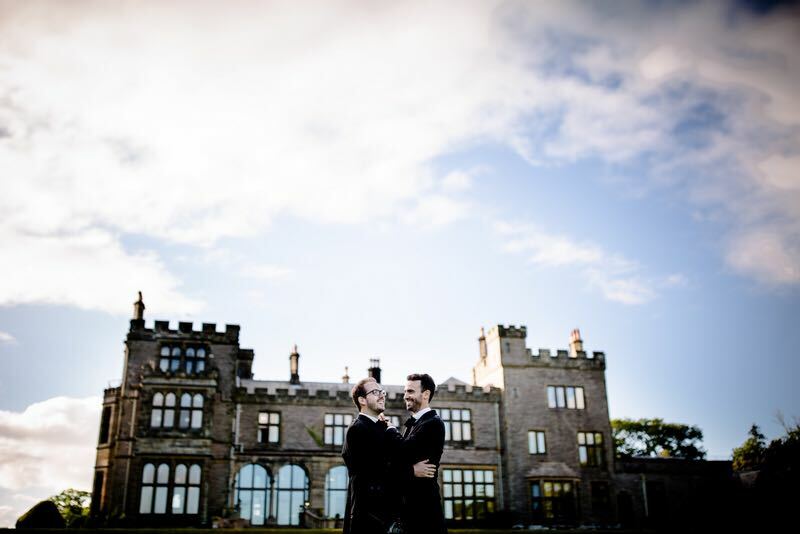 They booked an outstanding venue – the stunning Armathwaite Hall Hotel in the Lake District – a very special place to them, as it is where the proposal took place! How romantic! There was only going to be myself, the couple and a photographer, Gavin Powers, for the ceremony so it was going to be really intimate. 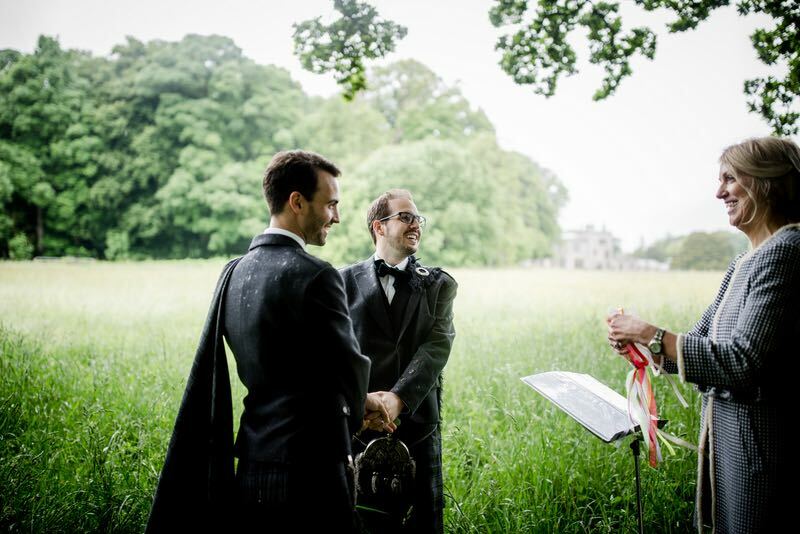 We exchanged emails over the next couple of months and created a personal ceremony that celebrated them as a couple, their love and commitment to each other, as they intended to hold their legal marriage in France the following month. 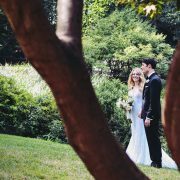 We arranged to meet the day before their special day to have a run through and ensure everyone’s expectations would be met. It was also on this day that I was introduced to the wonderful and talented photographer Gavin who would be capturing there special day. The weather was true British weather… Rain! 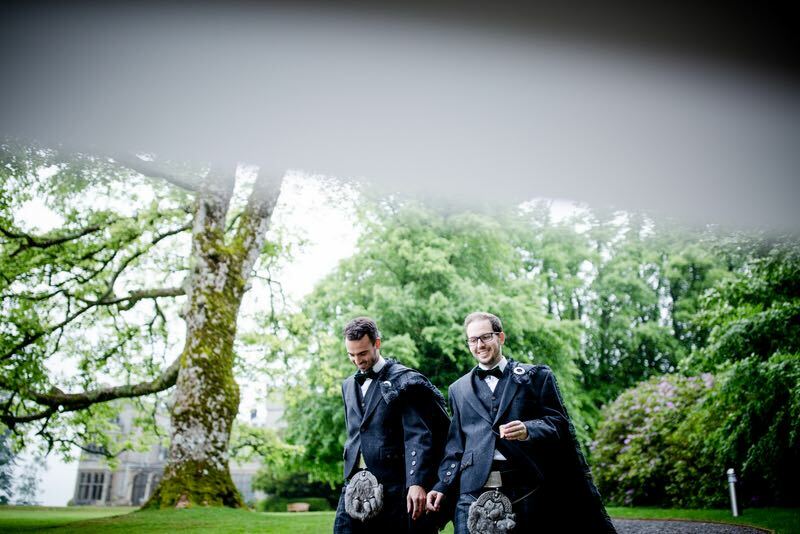 But Romain and Yohann did not let this spoil their day one bit.Dressed in gorgeous matching traditional kilts – with bowties made out of wood, I had never seen anything like them before! Such a handsome couple. 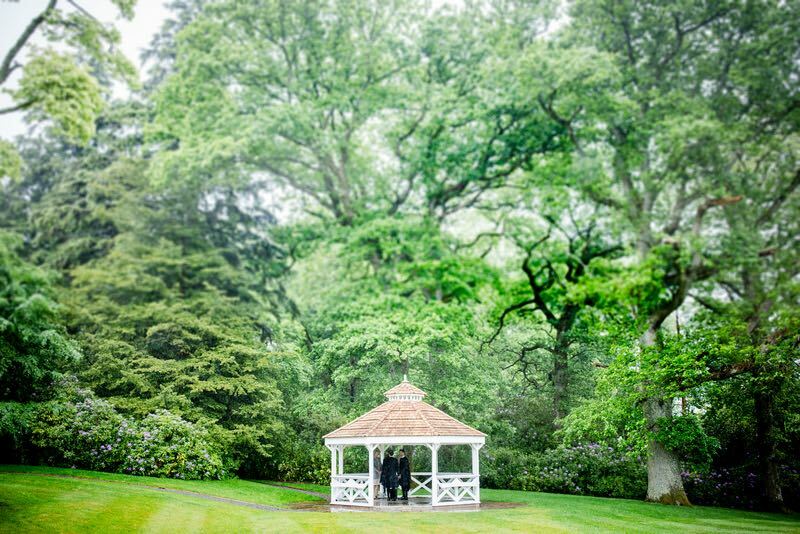 Due to the rain, we held the first part of their ceremony under a pretty pagoda in the gardens of Armathwaite Hall Hotel. 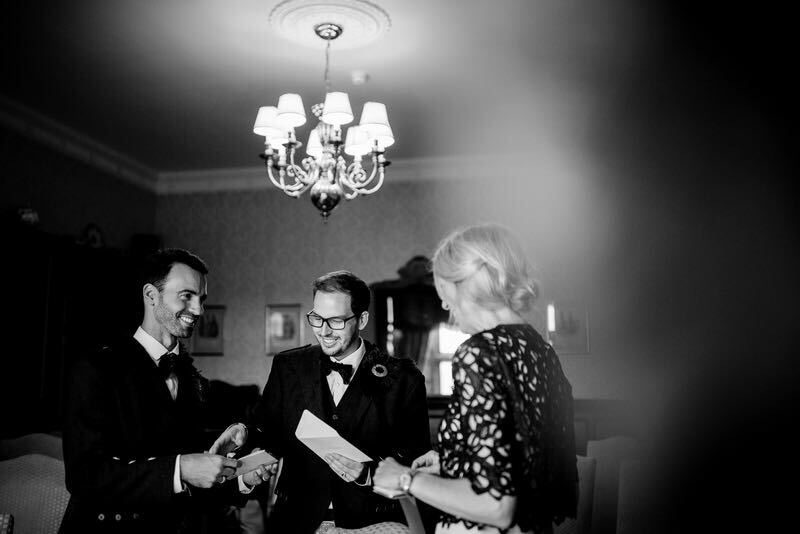 It is here that I took Romain and Yohann back over their story, how they met, what they love about each other and what they are looking forward to, they also chose to exchange traditional vows and personal promises. 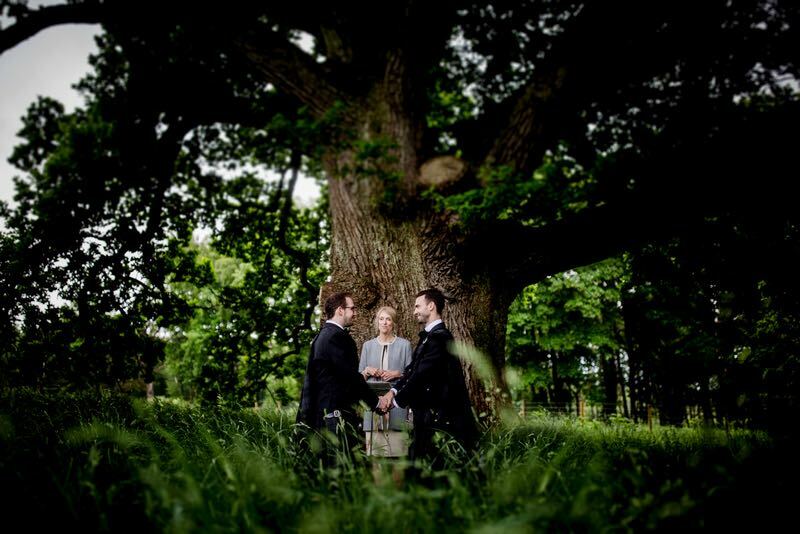 Then we took the brave move to hold the next part of their ceremony in a field at the far end of the gardens, under a beautiful old Oak tree, it was a stunning location and more importantly it is exactly what my couple wanted! 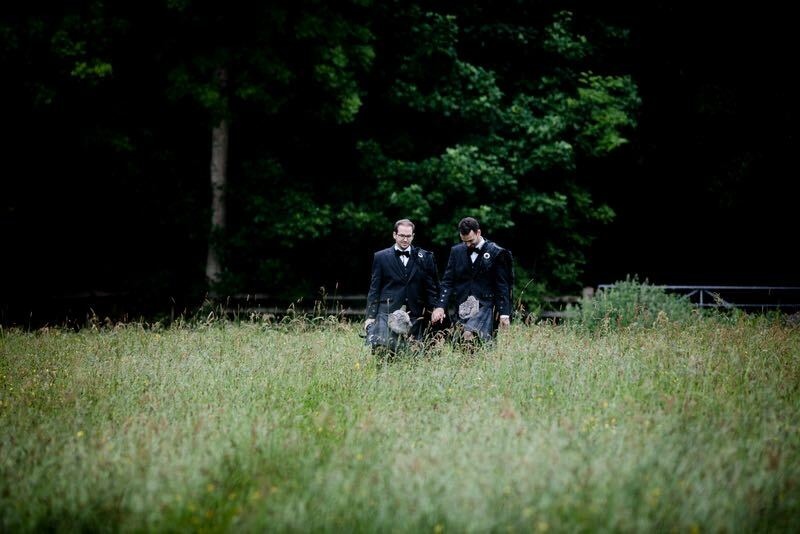 So through the long grass we rambled, me in my heels, the couple in their woollen jackets and kilts and the photographer, the rain could not stop us! The location was perfect and it meant so much to them both – we laughed as we all wondered what a spectacle we were to all the other guests! This only added to the romance and fun of the day! 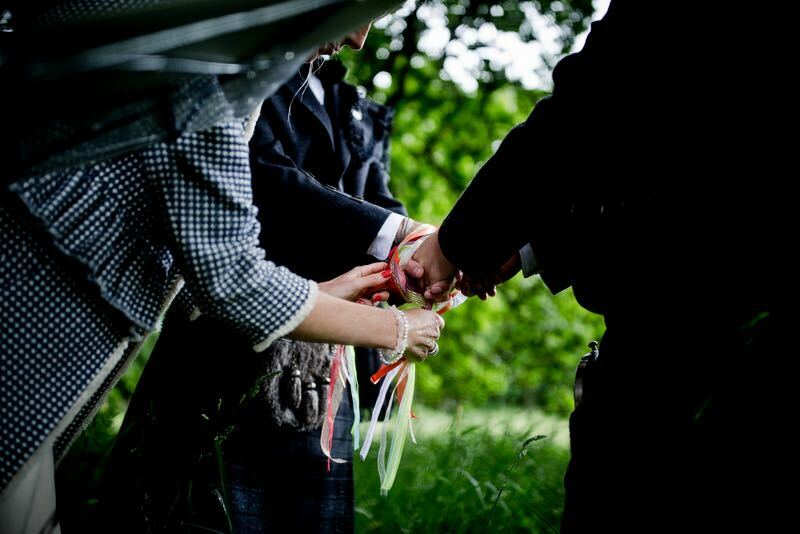 Once under the huge oak tree (avoiding the nettles) we began the Handfasting. Romain and Yohann (although not “Rainbow” kind of guys) wanted to acknowledge and honour Gilbert Baker, choosing rainbow coloured ribbons the symbol for LGBT (which you can see in the photo) we gave thanks to the courageous work and endeavours of people like Gilbert – equality for everyone in all aspects of life and marriage. I thought this was not only emotional but an inspirational touch. 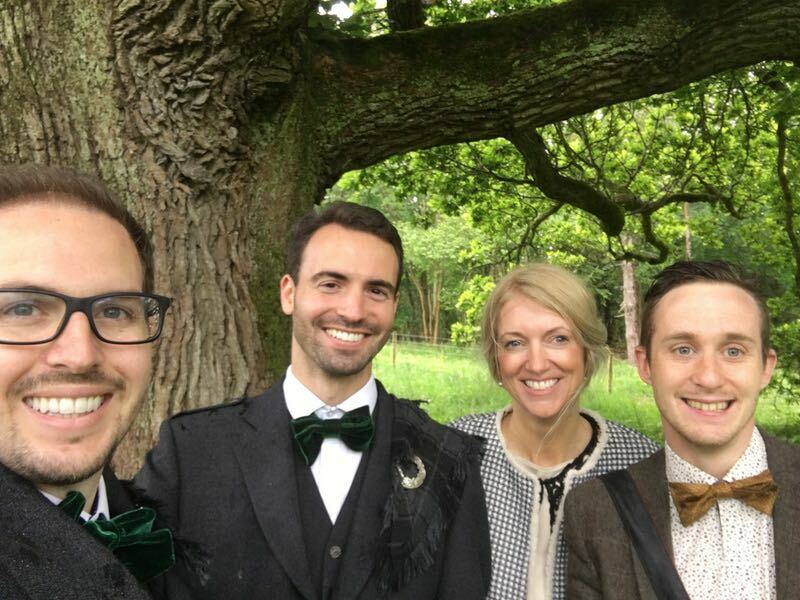 As it was only the four of us, I had the pleasure of tying the rainbow ribbons together – it really was an honour. 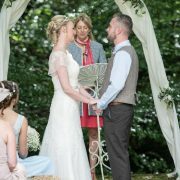 Once I had removed the ribbons, never to be untied, our couple exchanged their wedding bands after which I blessed their hands and as a surprise to them both I read a beautiful reading about Love. Before closing the ceremony I asked them both to look around, at the special place they had chosen, asking them to hold in their hearts the true meaning of coming back to where Yohann had proposed, then I blessed their intimate union and congratulated them both as they kissed. Myself and Gavin gave them the biggest round of applause that two people could muster! We all had a lovely glass of bubbles and cup of tea (to warm up) before they changed outfits and left for their photographs. 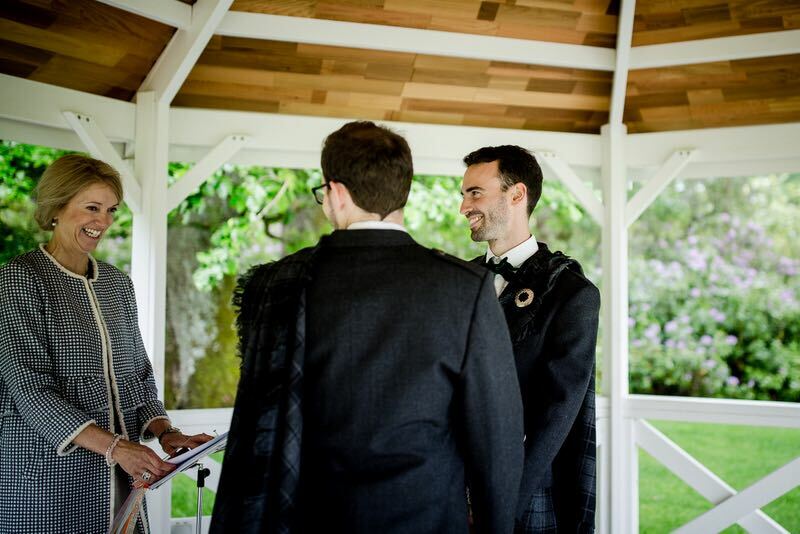 I have to say these two true gentlemen and their very personal ceremony really is lodged in my heart as being not only beautiful but very meaningful and I’m honoured to have been a part of such a memorable day. Thank you so much for taking the time to read this post. Feeling inspired? Get in touch today to talk about how I can help you create your perfect happy ever after. Also, don’t forget to please help and spread the word, email this to a friend who is thinking of an Elopement or Wedding Blessing Ceremony or share it on social media. Thank you!